The South Dakota Pilots Association promotes the active support of the South Dakota Aviation Hall of Fame through the SDPA newsletter. The SD Aviation Hall of Fame is a non-profit South Dakota corporation with federal tax-exempt status, established to honor the pioneers and contributors to South Dakota aviation. 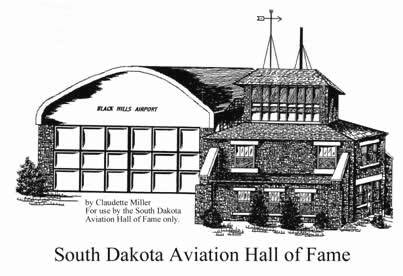 One goal of the SD Aviation Hall of Fame is to construct a building on the Black Hills Airport / Clyde Ice Field, Spearfish, SD, to display their aviation history, accomplishments, impact on South Dakota, and memorabilia. If you know of someone from South Dakota who you believe would be a good nominee for the South Dakota Aviation Hall of Fame, please complete and submit the appropriate Nominee Application or contact Ted Miller at 605-642-0277. Famous inductees such as Clyde Ice, Joe Foss, Duane Corning, Nellie Willhite, Charles Gemar, and more have been honored by the SD Aviation Hall of Fame. 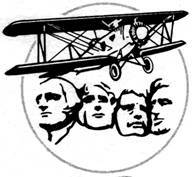 Over 270 combat aircrew members have been inducted into the Combat Air Crew Memorial section of the South Dakota Aviation Hall of Fame, and were residents of South Dakota who served their country with honor while flying combat tours in the many wars of the United States, from World War I to the present. Presently, the South Dakota Aviation Hall of Fame, Inc. has an exhibit of Aviation Hall of Fame members and combat aircrew members at the South Dakota Air and Space Museum located adjacent to Ellsworth Air Force Base, Box Elder, SD. A new home (shown right, drawn by Claudette Miller) is planned in the future at the Black Hills / Clyde Ice Field, Spearfish, SD, to house the exhibit, aircraft, and memorabilia of the Hall of Fame members for future generations. A building fund has been established and donations are solicited for this unique South Dakota institution. Your contributions are greatly appreciated. A contribution wall will be constructed and consist of plaques showing the donor’s name and section. The SD Aviation Hall of Fame is searching for a “Light Sport Plane” to use in a fund-raising raffle. If you know of a light sport plane like a J-3 Cub or PA-11, PLEASE contact Ted Miller at 605-642-0277 or email bha@mato.com -- at your earliest opportunity!! Once a plane has been secured for a Raffle, flyers about the raffle will be mailed through out the state and advertised in the newsletter of the South Dakota Pilots Association. Tentatively, a Raffle drawing will be held in mid-September. Raffle tickets will probably cost $50 each. MORE DETAILS LATER. Make checks payable to the SD Aviation Hall of Fame, and mail to SD Aviation Hall of Fame, 424 Aviation Way, Spearfish, SD 57783. Your raffle ticket will be mailed to you. Need not be present to win. Proceeds to the SD Aviation Hall of Fame, non-profit 503-C. If you have artifacts or an aircraft to donate to the South Dakota Aviation Hall of Fame, please contact Ted Miller. When my Dad started welding chromoly steel in our one-car garage, my 6 year-old eyes were wide with excitement -- this pile of metal was going to be our airplane? I spent every evening with him "working" on the airplane. I really could help with some things, like stitching the Dacron covered wings, but I'm sure he put up with my assistance, hoping that I would love it as much as he did. My Dad finished the Stits Playmate in just under 2 1/2 years, the fastest time to date for one to be finished. N6515 was the first to fly after Ray Stits flew the prototype. The Playmate made its first trip to Rockford, Illinois in 1969, coming home with a trophy. My Dad and I flew many more years to Oshkosh. We had the airplane in parades, in malls, almost anywhere anyone invited us. The folding-wing design made it easy for it to be transported as well as allowing it access to places where many other aircraft cannot go. It had the engine updated early on to the Lycoming 150 hp, which gave it more power, and makes it quite a peppy little craft to fly. Dad and I rebuilt the Playmate in 1990, giving it all new fabric, new interior, and new avionics. This time I could participate much more fully, and my Dad and I had a wonderful time doing it together. What a joy it was to receive the first Paul Poberezny Founders Award for classic custom homebuilt in Oshkosh in 1991. While flying with my Dad all those years, I got my license, graduated from medical school, completed my psychiatry residency, got a Skyhawk, and missed Oshkosh only twice in all those years. I then married the most wonderful man, Art, a pilot, who lives in Badger...on SD19. My Dad died in 2002, and I want a place for the Playmate to live forever. Information from Rob Burton (Hill City, SD) September 2008: The “Jeep” was designed and built by Ralph Burton in 1941 at the old Alliance Airport, Alliance, NE. Ralph was killed in the crash of a Beech Staggerwing near Philips, SD, on March 27, 1944, while carrying airmail between Cheyenne, Pierre, and Rapid City. The plane was lashed to the top of a car and moved by Ivan Ellis from Alliance to Spearfish, SD. The single seat plane had a Continental A-40-4 engine (salvaged from a wrecked Taylorcraft), 18-foot wingspan, and 12-foot overall length. 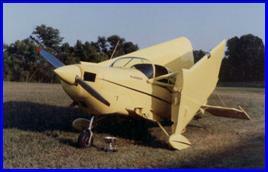 The parasol wing was adapted from a Taylorcraft airfoil and had modified Friese ailerons. Newspaper accounts from 1941 report, “The plane takeoffs and lands at 55 miles per hour [and has reached speeds as high as 120 miles per hour]. Its cockpit is so small that the instrument panel is only a few inches from the pilot’s face, and the seat is recessed to permit the pilot to wear a parachute.” The plane was called the “Jeep” after a popular air racer built by Art Chester. Rob Burton (nephew of Ralph Burton) stored the dismantled plane in a garage for many years. The plane was rebuilt for static display by Ivan Ellis in 1998-1999, and displayed at Black Hills Aero on Spearfish Airport in August 2002 at the time of the induction of Ralph Burton into the SD Aviation Hall of Fame. Three people were inducted into the SD Aviation Hall of Fame during ceremonies held at Black Hills Airport - Clyde Ice Field on September 8, 2018. Aviation started for Gary with his first ride in his father's Aeronca Champ at the age of two. At the age of four or five, he began holding the stick in the back seat of the airplane. When Gary was seven years old, his father, Gail Coe, attached blocks to the rudders so Gary could reach the rudders to steer the airplane. At the age of 12, Gary became his father's gunner for aerial hunting of fox and coyotes. A couple years later, Gary witnessed his first aviation fatality of neighbors who were also hunting coyotes. This experience impacted Gary's aviation safety awareness until this day. In 1963, at age 20, after having flown most of his life already, Gary took flying lessons from people such as Arnold Kolb, Darrel Blomberg, and Raymond Kolb. In December of 1963, Gary received his private license with Raymond Kolb as the examiner. During that prior summer, Gary flew with Arnold Kolb to Cody, WY, to help put cylinders on Arnold's first B-17 slurry bomber. During that time, Gary had the experience of flying in that B-17 with Ray Elgin and Arnold Kolb. After receiving his private pilot certificate, Gary who had attended South Dakota State University prior, returned and began teaching his ROTC friends in college how to do short field pasture landing techniques. In 1966 Gary graduated from South Dakota State University, commissioned as a 2nd Lt U.S. Army Signal Corps. In December, 1969, Gary received an honorable discharge from the Army and returned to South Dakota. In 1970, he earned his commercial, instrument and multi-engine ratings. From 1975 to 1980, Gary operated Sturgis FBO with his wife Sandee. The operation encompassed aircraft sales, Part 135 air taxi, student instruction, complete maintenance facility and a large aerial application business. 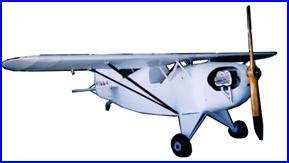 The airplane sales included dealerships from Cessna Ag, Cessna People, Citabria, and Taylorcraft. During this time, over 200 new and used airplanes were sold. Gary also flew extensive Part 135 including numerous air ambulance flights primarily for the Veterans Administration. He also accumulated thousands of hours in aerial application in South Dakota, Wyoming, Montana, and Nebraska. Gary continued flying in corporate personal business and some agricultural pilot service for several years. In the 1980s, Gary did pilot service for such firms as Duhamel Broadcasting, Hills Material, Stan Adelstein, Custer Lumber, and other South Dakota companies. In the year of 2000, Gary took time off from the company he and his wife owned to fly for Mayo Aviation, in Denver, CO, in order to obtain turbo-prop experience. He flew single pilot IFR King Air 90s and 200s into every mountain approach in Colorado. He continued his pilot services in Montana for a time as a flight instructor, charter pilot, turbo props and multi-engine. Inducted into the South Dakota Aviation Hall of Fame on September 8, 2018. Randal (Randy) Pfutzenreuter has a career spanning 48 years in design engineering and electronics packaging in aircraft simulators, flight test, satellites and satellite tracking and receiving, Mars lander, Apollo lunar experiments, Apollo flight monitoring, radar systems, counter measure systems, missiles and missile tracking, test and training pods, advanced cargo handling systems, aircraft instrumentation and Tempest shielded ground support electronics racks. Some of the aircraft and helicopters supported were the Boeing 727, C-5A, DC 9, F-14, F-15, F-16, F-22, F-35, E2C Hawkeye, B52, C130, deHavilland Dash 8-400, Lear 45, Boeing 767, Embrarer 145, MH-47 D/E and CH-47D, Raytheon Model 390 Premier 1 and experimental Sikorsky variants. Satellite and space equipment included Earth Resources satellite for Argentina, DCSC military satellite, Mars Observer satellite, Apollo tracking and monitoring 19" chassis and racks, Apollo 15 Lunar Surface Experiments Package, Mars Sojourner Rover. Missiles and tracking equipment include Lance, TOW, tracking antenna electronics packaging and mobile azimuth tracking. The companies where the engineering work was performed on a permanent employee and a consulting basis were Collins Radio, Sperry-Univac, Honeywell, LTV Aerospace, Conductron division of McDonnell Aircraft, Hamilton Standard, Learjet, deHavilland Aircraft, Bend ix"Aerospace, Electromagnetic Sciences, DRS, Scientific Atlanta, Loral Information Systems, ILC Dover, Teledyne- Lewisburg, Raytheon Aircraft, ST Keltec, Metric Systems and Norden Systems. Randy has been issued two U.S. patents in the medical field, the patent numbers being 6,482,190 B1 and 6,132,407. This work began before the time of calculators, copy machines, and CAD systems. Typing pools, slide rules, and drawing boards were the tools of the early days. Not until the mid-eighties did computers become common place in the industry. Inducted into the South Dakota Aviation Hall of Fame on September 8, 2018. 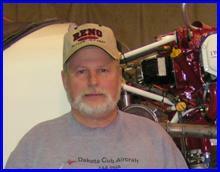 David Van Liere was born in 1949 near Colton, SD, a farm kid who had a passion to be an aviator. Volunteering to join the U.S. Army flight program in the height of the Vietnam War while studying at Dakota State, he knew this was his chance to learn to fly. A decorated combat veteran flying the Cobra Gunship, he returned to the Sioux Falls area after flying hundreds of combat missions in the early 1970s to purse his goal of being a professional pilot. While working on his CFI and ATP ratings, he became a SD school teacher while serving in the SD Army National Guard and Civil Air Patrol. Spending years in the Sioux Falls area, he instructed many learning to fly and served his state at the same time. Discovering a passion to instruct and pursue a greater career in aviation, he branched out across the country flying in corporate aviation. Getting into competition aerobatics, he competed at Fond Du Lac, WI, against future greats in the Pitts Special. During the 1980s, he got into the vintage warbird business. This included the sale, purchase, maintenance, and training in radial engine aircraft like the T-6, Stearman, and Mustang. This lead into classic jet aircraft as they began to be imported into the states. He was one of a small group who began teaching, maintaining, and selling jets like the T-33, Venom/Vampire, HA-200 Saeta Jet, and L-29. He started a formation jet aerobatic team and performed for years across the country while never passing up an opportunity to let the crowd know he was from humble beginnings in South Dakota. He was widely regarded as the aircraft subject matter expert on multiple classic jet aircraft. Due to such a diverse background of aviation experience, he had the distinct honor to be one of the first few individuals designated by the FAA to give type-ratings in exotic jets and high-performance piston aircraft as well has heavy helicopters. Over his 40 plus year career in aviation, he accrued over 20,000 hours of flight time. Instructing over 500 people and giving well over 100 type-ratings in fixed and rotor wing aircraft, he enjoyed instructing and inspiring others, while making a living doing what he loved. A speaker at many conventions on emergency situation handling, a board member and holder of a surface-level aerobatic waver for many years, he enjoyed performing as well. Among many ratings including the P-51 Mustang, he was an A&P that could maintain aircraft as well. Completing his long career by working for defense contractors and getting back into flying helicopters as an EMS emergency pilot in the Indiana region he rekindled some of the skills earned many decades before over the skies of Vietnam. He was a jet lead at Oshkosh numerous years, receiving the unique experience to instruct high-profile individuals and celebrities along the way. A truly diverse career that involved many close calls handled with the calm voice and aircraft handling precision he was known for by his peers. He retired to Indiana with his wife Jayne and is the father of two children, Chris and Laura. He enjoys the fact he was able to have a long, exciting and rare career in aviation that was done his way. It inspired many over the years that a farm kid from SD can do amazing things with a strong desire and the right support from family and friends. Inducted into the South Dakota Aviation Hall of Fame on September 8, 2018. Three people were inducted into the Combat Air Crew Memorial section of the SD Aviation Hall of Fame during a ceremony at Black Hills Airport - Clyde Ice Field, Spearfish, on September 8, 2018. Lee Bevers was born April 22, 1920, near Rauville, SD. He died January 5, 2013, in Watertown, SD. He grew up in the farming community near Watertown. He graduated from Watertown High School in 1939 and served in the U.S. Army Air Corps as a B-17 pilot in the European theatre from April 1943 until January 1946. During his service career, Lee was based in England and flew bombing missions over France, Germany, and Poland. On his 13th and 21st missions, his plane was badly damaged by enemy fire, but he managed to return to England with only one crew casualty. On his 26th mission over Augsburg, Germany, his luck ran out, and his plane, the Vera Mae, was shot down. All crew survived and became prisoners of war at Stalag Luft 1 in northern Germany until the end of WWII. For his bravery and meritorious service, Lee was awarded the Silver Star, the Distinguished Flying Cross, the Purple Heart, the Air Medal with 3 Bronze Oak Leaf Clusters, the Prisoner of War Medal, the American Campaign Medal, the European-Afri­can-Middle Eastern Campaign Medal with one Bronze Service Star, the WWII Victory Medal, and the Honorable Service Lapel Button WWII. After his release from prison camp, Lee returned to South Dakota and farmed south of Hazel until his retirement. Jon Thomas (Tom) Jones was born on June 26, 1941, in Rowena, SD. He graduated as salutatorian from Brandon High School in 1959 and Augustana College in 1963. Tom enlisted in the USAF and entered Officer Training School in February 1965. Upon graduating as a 2nd lieutenant, he was assigned to Vance AFB, OK, for pilot training. He received his wings in June of 1966 and had F-4C training at Davis Monthan AFB, AZ, and MacDill AFB, FL. He arrived at Cam Ranh Bay, Vietnam, in March 1967, where as a member of the 559th Tactical Fighter Squadron. He flew 261 missions over South and North Vietnam. During that period, he experienced the Tet Offensive, the Battle of Dak to Special Forces Camp, and the Siege at Khe Sanh, among many other hostile actions. Tom completed this tour in March 1968. He was again assigned to Vance AFB, this time as a T-38 instructor pilot. During this assignment, he also delivered an F-5 fighter to Iran, completing a 21-day trip over the Arctic Ocean and through Europe to make the delivery. He was next assigned to Nellis AFB in Las Vegas, NV, in the F-111A. After becoming combat ready, Tom delivered a replacement F-111A to Takhli, Royal Thai AFB, Thailand, and began his assignment with the 430th Tactical Fighter Squadron. He later was assigned to the 428th Tactical Fighter Squadron in Thailand and spent the next 11 months on bombing missions. He returned to Nellis AFB in May 1974 as an F-111A instructor and Squadron Executive Office in the 442nd Tactical Fighter Training Squadron. Tom was selected for promotion to the rank of major in 1976. He turned down the promotion and separated from the Air Force in December 1976. Tom amassed 345 combat missions and was awarded the Silver Star, three Distinguished Flying Crosses, and 21 Air Medals in addition to many other decorations. He logged more than 4,000 cumulative flying hours between the T-37, T-38, F-4C, F-111 A, T-33, and F5 aircraft. Appel, Edward W. , Lt. Col.
Artley, Carvel R., Lt. Col.
Baker, Lyle C., Lt. Col.
Beckel, Kenneth T., Lt. Col.
Benson, Vernell C., Lt. Col.
Burke, Virgil L., Lt. Col.
Eibart, Don C., Lt. Com. Eymer, Quentin G., 2nd Lt.
Flynn, John (Pat) P., Jr., Lt. Col.
Kortan, Laverne J., Lt. Col.
Maltese, Frank P., 1st Lt.
Mortensen, Jeffrey S., Lt. Col.
Muchow, Howard A., Lt. Col.
Nelsen, James S., 1st Lt.
Nelson, Kenneth W., Lt. Col.
Nielsen, Niels Robert, Jr., 1st Lt.
Ohnstad, John V., Lt. Col.
Oliver, Thomas K., Lt. Col.
Pravecek, Lawrence E., Lt. Col.
Reynolds, Marc C., Lt. Gen.
Root, Roger D., Lt. Col.
Schott, Douglas W., Lt. Col.
Schroeder, Kenneth A., Jr., Capt. Scott, Melvin R., Lt. Col.
Teachout, Gerald E., Lt. Col.
Tufty, Iver O., Br. Gen.
Winstead, Howard E., 2nd Lt.
Yirka, Robert C., Lt. Col.